Between the 1880s and 1910s, small groups of Indian Muslim peddlers made regular trips from Calcutta to the port of New York. The men were from the district of Hooghly in West Bengal, a region renowned for its production of silk and cotton embroidery. These men spent each summer working along the boardwalks of Atlantic City, Asbury Park and Long Branch, New Jersey where they sold their wares to the era’s throngs of vacationers. At the end of the season, a few members of the network returned to India, but most made their way to New Orleans, which became the network’s U.S. hub. New Orleans not only provided a year-round flow of tourists and travelers – the peddlers’ primary customers – but it also connected them to other Southern cities – Dallas, Memphis, Atlanta, Jacksonville, Charleston – the South’s main centers of commerce and consumption. And New Orleans was a gateway to ports further South – Havana, Belize City, Colon – frequented by a growing class of U.S. and European leisure travelers. Over the years, scores, and possibly hundreds of peddlers from Hooghly and Calcutta moved through these circuits. A small number also settled at key points in the network, most notably New Orleans. Here, a group of Bengali men married local Creole of Color women with deep roots in the city as well as African American women tied to more recent Black migrations into New Orleans from the post-bellum rural South. 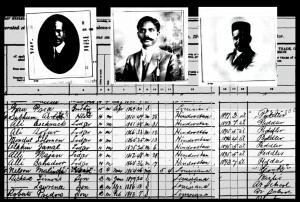 Most of the Bengalis settled in the neighborhood of Tremé, where, by the 1920s, they set up clothing shops along the neighborhood’s main commercial thoroughfare of North Claiborne Avenue.